This article originally appeared at MekongReview.com. “We were very sure at that time that there was one side that should win: the National Liberation Front. But in the spirit of the Paris Peace Agreement, signed in 1973 not long before we arrived in Vietnam, we hoped that peace would be established by means of a coalition government. Unfortunately, the provisions of the agreement were ignored in Saigon, so the war ended in 1975 with the communists’ military victory. Looking back, I believe more strongly than ever that [the] AFSC and the Quakers played an important role in trying to bring about a peaceful solution to the war. The war ended in tragedy for many people and a peaceful resolution would surely have been better for all of the Vietnamese”. Quinn-Judge makes this case forcefully and poignantly in The Third Force in the Vietnam War: The Elusive Search for Peace, 1954-75. Hers is not an autobiography, but her activism for peace in Vietnam influenced how she wrote this book on that subject. From start to finish, she argues that things could have been different had the main belligerents just given peace a chance. A third way existed during the period between 1954 and 1973. A different outcome than the communist takeover of the south and exclusion of the peace-minded “third force” could have emerged in 1975 had neutralist, human-rights respecting and democratically committed Vietnamese been allowed to form the promised coalition government and negotiate with the communist north. The NLF may have been a communist creation, Quinn-Judge concedes, but it attracted a wide range of impressive non-communists, disenchanted with the ineptitude and repression of South Vietnam’s leadership and capable of negotiating in good faith with the communists and the United States. Lastly, these peace-minded Vietnamese in the south could have steered a southern coalition government through the treacherous waters of the Cold War by adopting a truly neutralist foreign policy. Many decolonising states had been doing precisely that since the Afro-Asian Conference at Bandung in 1955, and just as many Western states were urging the Vietnamese to do so now. In short, a non-aligned coalition government in the south could have either organised elections to unify the country with the communists after 1973 or, though she never really comes out and says it, operated a separate, independent, non-aligned liberal democracy in the south for an undetermined interval. At the heart of the problem was the well-known decision taken at the Geneva Conference of 1954 to partition the country provisionally at the Seventeenth parallel. The communist-run Democratic Republic of Vietnam took over in the north while the State of Vietnam, re-baptised the Republic of Vietnam in 1955, did so in the south. Geneva allowed the French to get out of Vietnam and ended the First Indochina War (1945-54). But when the elections promised at the conference to reunify the country peacefully failed to materialise, hostilities resumed between the two Vietnams and, in 1965, the United States intervened militarily to ensure that the south did not fall to the communists. The Second Indochina War had begun. Her story is ultimately a tragic one, but it is also a fascinating study of how a remarkable group of Vietnamese, located mainly in the south, searched tirelessly for peace and neutrality between 1954 and 1975. They collectively constituted a “third force” consisting mainly of non-communist republicans, students, urbanites, lawyers and influential Buddhists and Catholics. By using the term “third force”, Quinn-Judge excludes those using violence and relying on foreign powers, like the religious militias the US had secretly armed in Graham Greene’s The Quiet American. “Third force”, for Quinn-Judge, refers to “non-violent political and social forces that attempted to play the role of intermediaries”. To her immense credit, she introduces a wide cast of little known “third force” characters — Catholics such as Nguyen Manh Ha and Nguyen Ngoc Lan; Buddhists like Thich Nhat Hanh; urban democratic politicians like Ngo Ba Thanh; and many more. Some joined the NLF. Others went it alone. But they all shared the common desire to carve out a third way — non-violent and neutralist — in order to bring real peace to the Vietnamese people. Readers who share Sophie Quinn-Judge’s pacifism and neutralism will find much to agree with in this book. 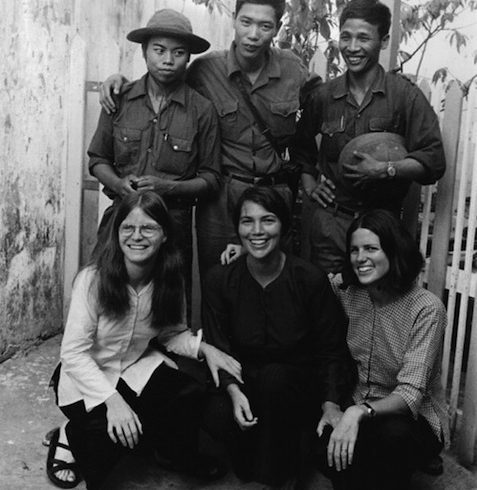 Few would disagree with one of the anti-war movement’s leading spokespersons, the late Marilyn Young, who praised Quinn-Judge’s book on its back cover for its “careful, thorough and persuasive analysis of the often heartbreaking efforts of non-aligned Vietnamese to help bring about peace”. Indeed, this is very much a book for the anti-war Vietnam War generation. Quinn-Judge relies approvingly on the work of like-minded scholars and former peace activists ranging from David Marr and Ngo Vinh Long to Frances Fitzgerald and Georges Kahin. She makes almost no use of the scholarship produced by the post-Vietnam War generation (other than those scholars using Chinese, Soviet, and East German archives). Those of the same generation who supported US intervention in Vietnam will undoubtedly condemn her book for what they will see as its overt bias against the US and the Republic of Vietnam. Others will inevitably insist that Hanoi’s decision to dissolve the NLF and the “third force” allies from mid-1975 only proves how naive these middle-of-the-roaders were. They might cite Truong Nhu Tang’s A Viet Cong Memoir as a record of how the communists eliminated one such non-communist in the NLF upon taking the south. That said, although one might disagree with her interpretations, Quinn-Judge has provided the first serious study of the “third force” in Vietnam and its failed quest to bring peace to the country. We should all be grateful for that. However, her decision to write such a book raises some basic epistemological questions that are too often forgotten in Vietnamese studies and US foreign relations when it comes to the Indochina Wars (1945-75). For one, when a historian produces a book so closely connected to his or her personal experiences and beliefs, the reader can rightfully ask how these influenced the final product. Peace is a phenomenon that has its own history and power, and it can influence those who defend it most ardently in their scholarship. Although we have no history of pacifism (or its Quaker strain) with regard to the Indochina Wars, a rich history of pacifism in Europe provides some comparative help. Scholars of European pacifism, for example, have shown how the elusive search for peace in France and Britain after the Great War influenced a host of intellectuals and historians writing on this controversial conflict. By seeking to disarm the past in order to promote peace in the troubled interwar period, these pacifists produced histories that dealt well with certain topics, struggled to account for others and avoided some altogether. Something similar could be said for the First Indochina War and the famous French Orientalist, Paul Mus, who militated in favour of bringing peace to Vietnam. He made his case in a series of highly influential books published in the early 1950s. His calls for peace cost him his job in France and caused him to move to Yale, where he helped get Southeast Asian studies off the ground. But one cannot fully grasp the significance of Mus’ writings on Vietnam without knowing that he had been a student of one of France’s most eminent pacifists and intellectual giants of the interwar period, “Alain” (Emile Chartier). Mus carried many of the beliefs of the European pacifist movement with him to Indochina. Right or Left, intellectuals are not neutral, and this is why Quinn-Judge’s pacifist past matters too. Peace-minded scholars are also prone to join the schools of “missed opportunities” or “lost peace” when conceptualising and crafting their books. Some choose to prove peace by reasoning counter-factually. Many combine the two. It’s hard for them not to do so. Quinn-Judge is certainly not the only peace scholar of the Indochina Wars to speak of what-ifs and could-have-beens in organising her narrative of the “third force’s” search for peace. Swedish-born Fredrik Logevall mobilised counter-factual history in making his argument that peace could have been achieved in Vietnam in 1964-65 had US President Lyndon Johnson not chosen war. Logevall’s close colleague, James Hershberg, weighed in with a large book on the flurry of vain international initiatives to broker peace. And one could add to this list the brilliant Norwegian scholar, Stein Tønnesson, a longtime member and former director of the prestigious Peace Research Institute Oslo. His prize-winning study of the outbreak of the war over Vietnam in 1946 shows how the first conflict could have been avoided — and with it the following one and all the ensuing bloodshed — had the French not missed the chance to negotiate with Ho Chi Minh. Quinn-Judge’s study of the “third force” fits into the “lost peace” school of writing on the Vietnam War. No one contests that peace is a noble endeavour. However, we sometimes forget that peace, like war, mobilises its intellectual soldiers not just during the war, but long after the guns go silent. And the higher the level of disagreement over the legitimacy of the war, the greater the level of scholarly mobilisation there will be. The problem is that this high level of mobilisation comes with a price. By framing their narratives and choosing their evidence to show that war could have and indeed should have been avoided, peace scholars sometimes (not always) find themselves travelling down one-way roads, unable to see other historical possibilities, skating over a multitude of social and political forces at work down below. And what I suggest here applies equally to those scholars militating in the opposite direction, in favour of the war and the righteousness of the US cause in Vietnam. The flip side to the school of “lost peace” is of course the one of “triumph forsaken”. Christopher Goscha is the author of The Penguin History of Modern Vietnam. Mission statement of the American Friends Service Committee’, athttps://www.afsc.org/mission-vision-and-values for the citations and alsohttp://www.nobelprize.org/nobel_prizes/peace/laureates/1947/press.html. The Bulletin of Concerned Asian Scholars is still looking for its historian. Norman Ingram, The Politics of Dissent: Pacifism in France, 1919-1939, Oxford, Clarendon Press, 1991; Martin Ceadel, Pacifism in Britain 1914-1945: The Defining of a Faith, Oxford, Clarendon Press, 1980; and above all John Horne and Alan Kramer,German Atrocities, 1914: A History of Denial, New Haven, Yale University Press, 2001. Fredrik Logevall, Choosing War: The Lost Chance for Peace and the Escalation of War in Vietnam, Berkeley, University of California Press, 2001. Stein Tønnesson, Vietnam 1946: How the War Began, Berkeley, University of California Press, 2010. On this important point, I’m deeply indebted to my colleague Andrew Barros, “War by Historiographical Means: The July Crisis, the ‘Objectivity Question’, and the Internationalization of History, 1914-1919” (unpublished paper). For the most sophisticated defence of the US war in Vietnam, framed around the idea of a “lost victory”, see: Mark Moyar, Triumph Forsaken: The Vietnam War, 1954-1965, New York, Cambridge University Press, 2009.